Connell, S.D., Doubleday, Z.A., Hamlyn, S.B., Foster, N.R., Harley, C.D.G., Helmuth, B., Kelaher, B.P., Nagelkerken, I., Sara, G. and Russell, B.D. 2017. How ocean acidification can benefit calcifiers. Current Biology 27: R95-R96. Ocean acidification, often referred to as the twin evil of rising atmospheric CO2 concentrations (the other evil being global warming), is projected by many to harm marine life directly as more and more carbon dioxide dissolves in the surface waters of the world's oceans in consequence of ever-increasing anthropogenic CO2 emissions. The increasing absorption of CO2 and associated decline in seawater pH values is thought to pose direct harm to marine life in the decades and centuries to come by affecting rates of survival, calcification, growth, development and/or reproduction. However, as ever more pertinent evidence accumulates, a much more optimistic viewpoint is emerging. The latest work to challenge ocean acidification pessimism comes from Connell et al. (2017) in an article titled "How ocean acidification can benefit calcifiers" that was published in Current Biology. Writing as background for their work, the ten scientists hailing from Australia, Canada, China, Italy and the United States note that a number of studies have reported negative direct responses of marine calcifying species under future elevated CO2 conditions in simple laboratory experiments, which finding, in their words, "intuitively suggests that ocean acidification has negative ramifications for the persistence of calcifiers in future oceans." However, they rightfully add that such conclusions are "largely drawn from single-species studies and simplified experimental 'communities' that may not necessarily translate to natural populations and communities." In this regard they note that increased marine plant growth driven by enhanced carbon availability due to ocean acidification can stimulate greater consumption by secondary producers, effectively allowing CO2 to act as a food or habitat resource for herbivorous calcifiers. And such "positive effects," in the words of Connell et al. "might overwhelm the direct negative effects of physiological stress of ocean acidification." To test this theory, Connell et al. studied the relationship between food and habitat for a calcifying gastropod species (Eatoniella mortoni) living in the sea under natural conditions near CO2 vents in the southwest Pacific Ocean. And what did their study reveal? 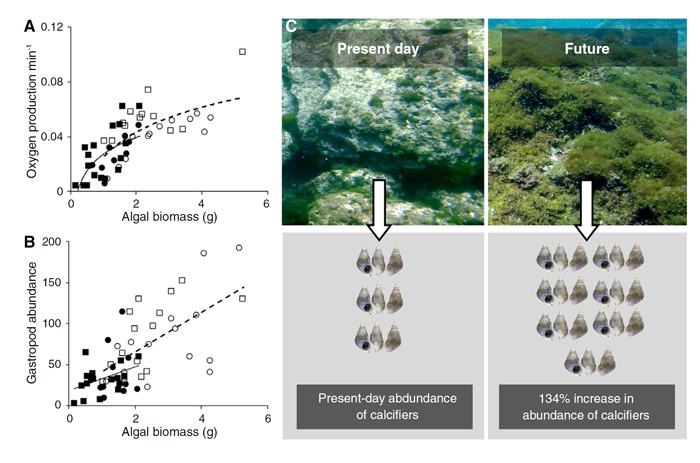 The increased CO2 (reduced pH) waters near the vents had a positive direct impact on algal biomass, which increase, in turn, was positively associated with gastropod abundance (see figure below). Thus, the scientists showed "how a vulnerable calcifier can benefit from elevated CO2 and consequently thrive under physiologically stressful conditions (i.e. the increased energetic demands associated with acid-base regulation and building shell material) due to the counteractive role of increased food and habitat." Figure 1. The response of (Panel A) primary productivity (p < 0.001) and (Panel B) gastropod abundance (p < 0.001) to increasing algal biomass (grams per quadrat) at two control sites (present-day CO2 levels; black circles and squares) and two vent sites (future CO2 levels; white circles and squares). (Panel C) Illustration of present-day and future primary productivity and present-day and future gastropod abundance. Source: Connell et al. (2017). In commenting on the significance of their findings, Connell et al. write that "to date, most scientific thinking has focused on enriched CO2 as a stressor by way of its associated reduction in aqueous pH. Whilst a stressor can be defined as an environmental disturbance that affects organisms negatively, it only captures one direction of biological responses. Yet, as shown in this study, enriched CO2 can act positively. Carbon enrichment acts as a direct resource for photosynthetic organisms (Connell et al., 2013). Indirectly, therefore, increased CO2 can act as a resource to consumers via the provision of food and habitat." And given that fact, the preoccupation with ocean acidification by so many to be a stressor to calcifiers "tends to bound the range of responses we might anticipate (i.e. type and magnitude of negative response), thereby limiting our capacity to anticipate the factors that accelerate or stabilize against changes in ecological communities." Consequently, we have yet another reason to reject the all-too-prevalent ocean acidification alarmism that runs rampant in certain circles of the media, activist organizations and politicians. Although ocean acidification might be shown to directly harm a marine organism in a simple laboratory experiment, out in the real world its indirect benefits may well be sufficient to completely ameliorate and overpower any negative direct effects. Connell, S.D., Kroeker, K.J., Fabricius, K.E., Kline, D.I. and Russell, B.D. 2013. The other ocean acidification problem: CO2 as a resource among competitors for ecosystem dominance. Philosophical Transactions of the Royal Society of London B 368: 20120442.